MOSCOW. 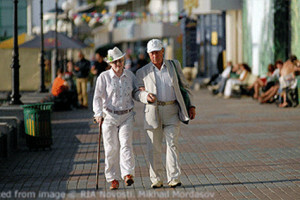 July 11 (Interfax) – The pension age in Russia should not be increased for everyone simultaneously, but for every category of pensioners separately, Russian Human Rights Commissioner Tatyana Moskalkova said. “It seems to me it would be premature to approach all categories of citizens directly in this way, at least bearing in mind the monitoring we have conducted. We need to take into account different categories of citizens and provide different systems for different categories,” Moskalkova said on Wednesday at a meeting of the Russian presidential human rights council, where the increase of the pension age was discussed. There needs to be a way to reduce the pension age for people who lost their jobs due to downsizing and allow some categories of older state servants to work in their positions longer, she said. Moskalkova also said there should be a smooth increase of the pension age. “In our administration, there’s a belief that there should be a smooth transition, and I agree,” she said. Moskalkova also suggested job quotas for older workers and changes in approaches to medical and social evaluations. That would ensure a more comprehensive and balanced approach to changes in pension legislation, she said.